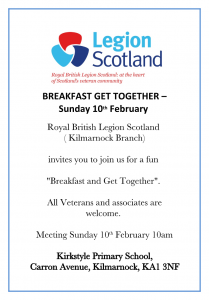 Royal British Legion Scotland (Kilmarnock Branch) Breakfast Get Together. Come along and join us for a fun breakfast and get together. All Veterans and associates are welcome.